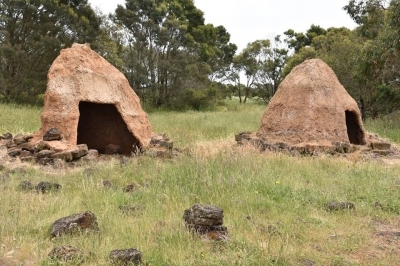 Budj Bim Cultural Landscape is part of the Tentative list of Australia in order to qualify for inclusion in the World Heritage List. Site visited in March 2018, both designated components. As Frederik described Tyrendarra area I would focus mainly on Budj Bim - Mt Eccles National Park. To get there you will probably need your own car as there are no public transportation in the area. The best place to start the visit is a parking near Lake Surprise (coordinates - 38°03'30.8"S 141°55'21.5"E). It is also a camping area with a small visitors centre with basic information about the place. Lake Surprise is a crater lake where former volcanic activity is still visible. There are 2 hiking paths around the lake the one just near the lake (allow at least one hour for the loop) and the second that goes on the crater rim (2 hours). The area is quite spectacular although there is not much to see in terms of ancient human activity. From that point you can also visit lava blisters and natural volcanic caves. One of them is called Natural Bridge and is located some 45 min from the visitors center. there is a direct hiking path and unsealed road. Coordinates of the place: 38°04'12.5"S 141°55'09.0"E.
Fortunately, UNESCO added Budj Bim in the tentative list before I finalized the whole itinerary of my Australia trip, so after checking its location, I conveniently put this unknown place as one of the must stops along the famous Great Ocean Road from Melbourne to Adelaide. Since the site was relative unknown, it was quite hard to find information and I afraid that the visit without any professional guide will not make my trip to be worthwhile, I still decided to go and explore the site by myself. 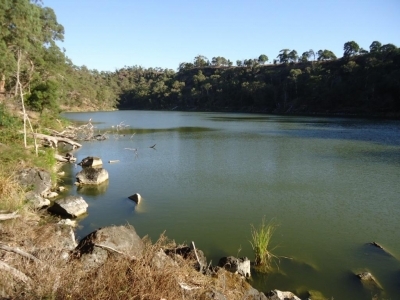 There are two components of Budj Bim, old Volcano of Mount Eccles together with nearby lake Condah and the old lave flow near town of Tyrendarra. After checking with google map, I decided to visit only the Tyrendarra area as the geography of shallow lake Condah and swampy Tyrendarra both are quite similar, and I have no interest to climb Mount Eccles or old mission ruins. On the road, I put my navigator to Tyrendarra Indigenous Protected Area, while the road is good just next to the main highway, the place gave a feeling that it was located on the middle of nowhere. I parked my car and saw a sign of warning of flood and snakes! Since I visited on spring, the small creek flooded the whole area of old lava flow. The small pedestal bridge to the nominated area was almost submerged by the strong high water. After I crossed the bridge I found an explanation board of the site’s history and value for Gunditjmara people. The whole area was flooded except along the pathway. I had to admit that the site was quite hard to understand and need a lot of imagination on how they transformed the whole area into fish farm in ancient time as the whole area was invisible and covered with reeds, at least the flood made me believed that the area was possible to create fish ponds and those aquacultures. In the overgrown reeds, I found a display of woven trap for catching eels once used by ancient Gunditjmara. Thanks to the display I started to appreciate how the system worked on series of manmade stone and wooden weirs that used woven trap as the water channels between weirs, simple but effective. I walked around the area and saw earth domes and stone huts that maybe used by ancient people for livings. I was not sure that these structures were replica or original ones. There also was a modern structure that designed to resemble eel trap displaying local arts, but nothing interesting. Budj Bim gave me a fine moment on local indigenous technology and culture. I was not sure that the site will give similar experience to other visitors, because I prepared and studied a lot before visit so I understood its value easily upon a quick glance, but still I would prefer to have experienced local guide to explain more. In my opinion the site is quite unique as a rare evidence of aboriginal aquaculture, with more investment to build interpretive center, it can be an interesting World Heritage Site in the future.